Cable transport had its boom in the Alps during WWI. During this period, cable systems were used extensively to supply mountain troops with firewood, food and ammunition. Starting in the 1950s, cable yarding became increasingly popular among logging firms for extracting timber, and machine manufacturers began producing dedicated forest yarders for the extraction of firewood and timber. 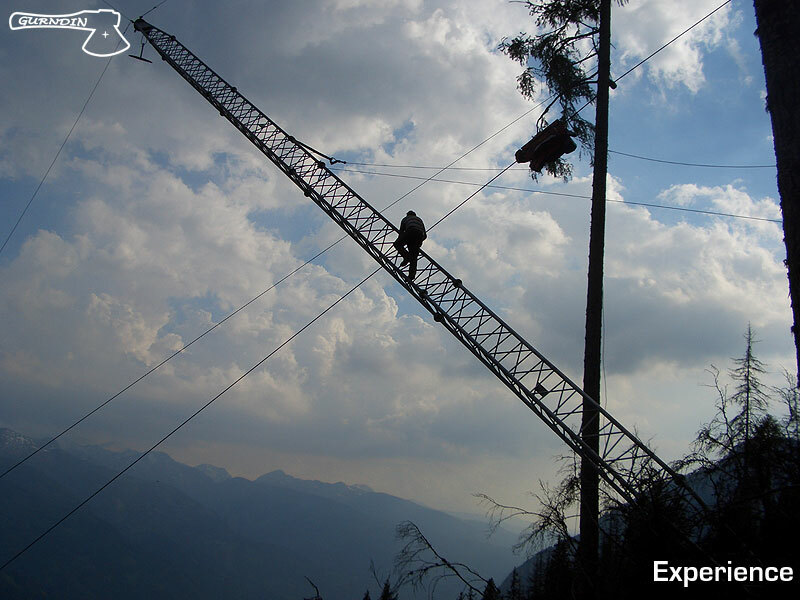 Our machinery fleet includes two sled-mounted yarder sets: these are capable of hoisting themselves to the upper end of the cableway, if no roads are available to reach this station. From there, the other cables are then laid down, set-up and tensioned. Such cable system can transport individual loads up to 5 tonnes, over a distance between 200 and 2000 m. If needed, both the payload and the maximum extraction distance can be further increased. This extraction system is particularly suited to steep sites, rough terrain and stands that are generally difficult to access. If needed, yarder set up can be made faster by using a helicopter to move the winch and other materials to the upper end of the cableway.